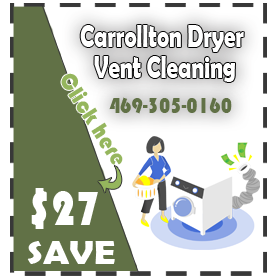 Carrollton Texas Dryer Vent Cleaning is your trusted companion in extending the useful life of your dryer machine. We are experts in dryer lint removal from your machine's hot air ducts. 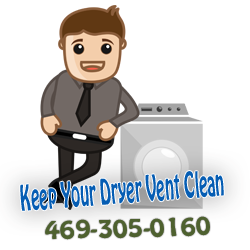 Our dryer vent cleaning service technicians are only a call away. If for instance your dryer is not as efficient as it should be in drying laundry you only need to contact us to have it checked out. An inefficient dryer can cause an increase in your energy cost spending because you often will have to run extra drying cycles. This makes it costly to dry clothes. It is advisable to have the lint build up removed in the interest of reclaiming your dryer. Of all the home appliances the dryer is probably the one application that uses the most energy. Removing moisture from laundry is a rigorous and energy consuming task that needs efficient flow of air and large quantities of heat. If at any one point the dryer is not functioning at optimal efficiency then it is likely to use excess energy. This increases the risk of causing fire outbreaks. Carrollton TX Dryer Vent Cleaning understands that dryers are often to blame for home fires and for this reason we work towards insulating your home from fires by servicing your dryer. We prevent fire by restoring your dryer efficiency. We will inspect and clean the dryer for safety, long life and efficacy. We are also experts in Dust mites removal and AC vents cleaning. The dryer can accumulate dust particles that provide the perfect breeding ground for dust mites. We have the expertise to eliminate the dust mites. Carrollton TX Dryer Vent Cleaning delivers dryer cleaning service premised on helping your laundry dry faster, extend the useful life of your dryer, and ensure the dryer runs safely. We work towards eliminating potential fire disasters emanating from your dryer.